Christmas Ornaments Made in USA - 2008 Supreme Court Gift Box Ornament - A Christmas Ornament Co. 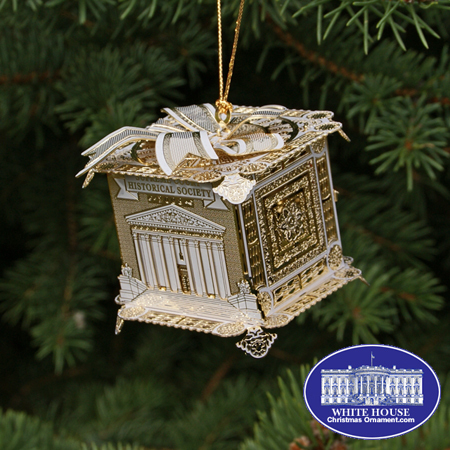 The White House Ornament Collection presents The 2008 Supreme Court Christmas Ornament. On the front, it features the front of the Supreme Court building. The Seal of the Supreme Court adorns the back of the ornament. The remaining two sides and top are accented with rosettes and other architectural elements from the interior of the building. This extraordinary ornament is topped with a bow. The 2008 footed "Gift Box" ornament is plated in 24kt gold.